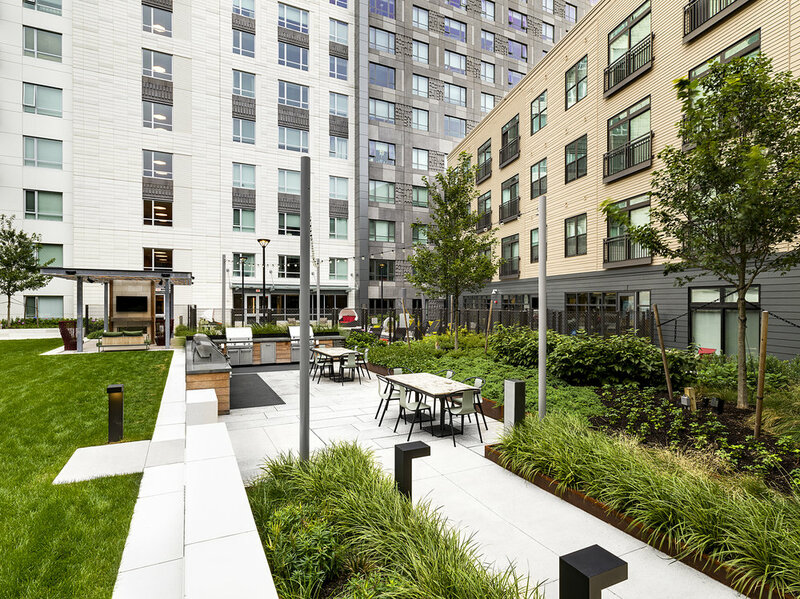 The 21-story Sky Deck and second-story courtyard add a cumulative 16,500 square feet of outdoor living space for residents of Montaje, a mixed-use building at Assembly Row in Somerville. 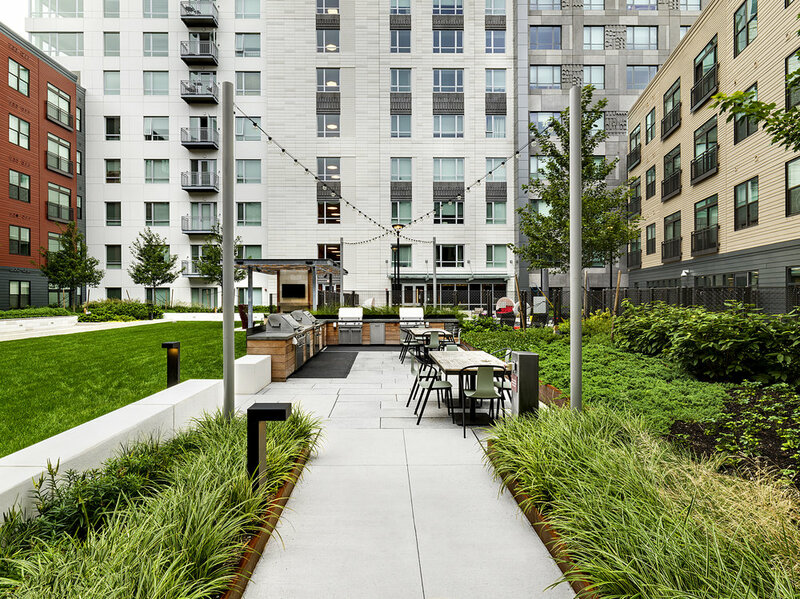 The second floor interior courtyard provides a dynamic community space fit with Bocce court, pool, lawn, outdoor kitchen, and countless landscape features. Recover installed over 200 linear feet of precast seat wall, precast banding on setting beds, pavers on pedestals, a granite patio, and custom corten edging to retain soil in beds. With soil depths from six inches to four feet, the courtyard features grading variations as well as an intensive plant palette of maple trees, woody and herbaceous perennials, grasses, groundcover, and lawn. These distinctive design choices add dimension and visual interest to the space. 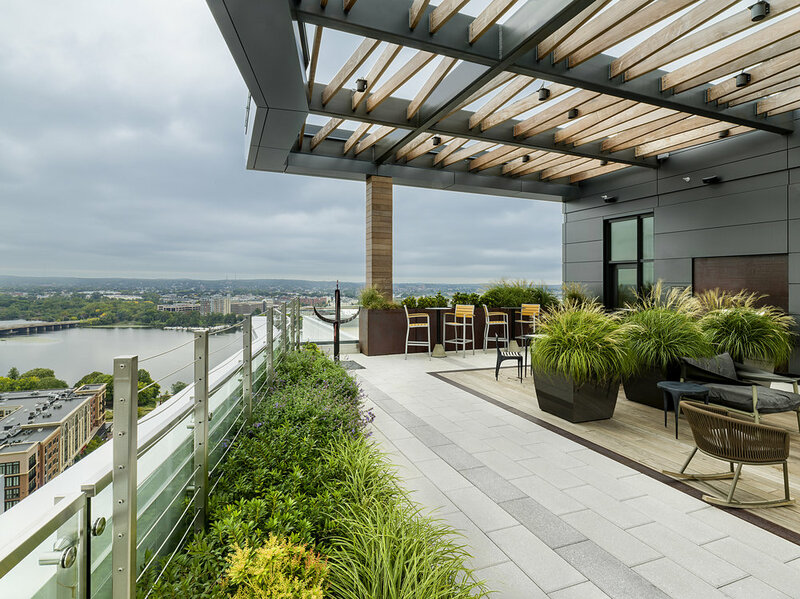 The Sky Deck features intimate seating, skyline views, and sculptural plantings to create Somerville’s highest oasis. Recover carpenters installed decking and wrapped pergola columns with FSC certified ipe, creating the feeling of relaxing in a forest canopy. The deck is framed by raw steel banding and custom-fabricated corten planters surrounded by a variety of paver styles. Recover also installed several interactive installations including a tower viewer and sundial, giving residents even more ways to enjoy the sweeping views.